Skulking behaviour similar to Nightingale but slightly smaller and slimmer, and showing rather long, fan-shaped, often cocked, tail. 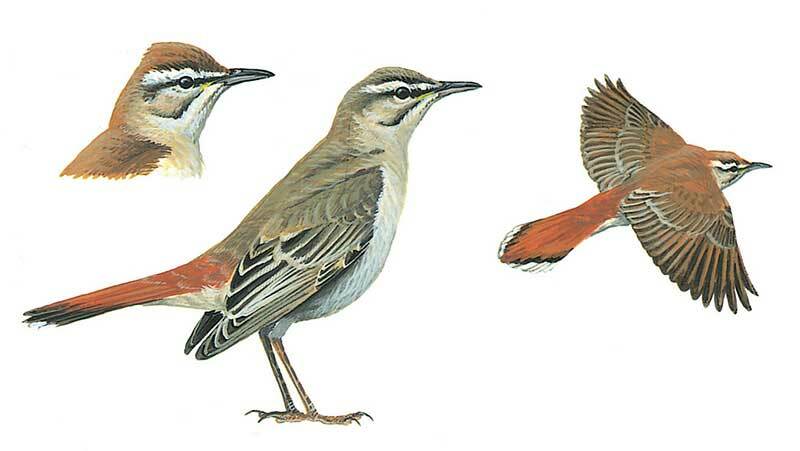 Upperparts grey-brown, contrasting with rufous rump and tail, the latter showing prominent black subterminal-band and white tips (broadening at sides), obvious above and below. Head distinctive with white supercilium contrasting with blackish eye-stripe. Juvenile has faintly mottled breast and flanks. Not really shy but usually close to cover; often feeds on ground.